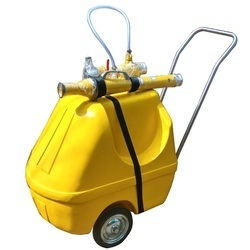 We are a leading Manufacturer of frp mobile foam trolley unit, mobile foam trolley 200 litre, portable mobile foam monitor unit, mild steel mobile foam unit, mobile foam trolley 500 litres and mobile foam unit from Mumbai, India. 1. It is made up of High Quality FRP Body . 2. Capacity of tank is 100 to 250 litres . 3. Foam filling inlet provided on the top of the tank with 2” BSP Cap and drainage facility available. 4. The chasis made up of stainless steel . 5. Large caster wheels with solid rubber tyre. 6. The distance of throw of foam not less then 16 meters . 7. It contain Inline Inductor of 225 LPM with pickup tube and Foam nozzle of 225 LPM. 8. The whole unit is easily handled by one person. 9. Hose pipe 2 x 15 meters come with complete sets. 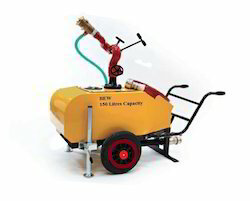 Capacity : 100 litres /200 & 500 litres or as per demand. Material : Mild Steel , Stainless steel. 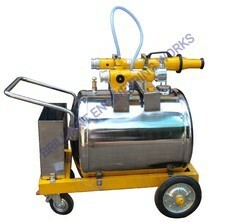 Mounted with Foam Inductor, Foam making branch pipes and Fire hose. 1. It is made up of High Quality Stainless Steel /Mild Steel Body . 2. Capacity of tank is 100 to 500 litres . 7. It contain Inline Inductor of 450 LPM with pickup tube and Foam nozzle of 450 LPM. 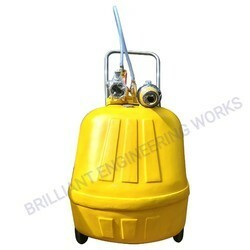 Capacity: 100 litres /200 litres or as per demand. 1. It is made up of High Quality Stainless Steel Body . 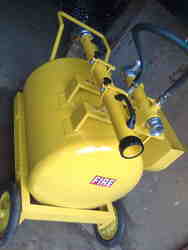 The unit is used for fast flexible emergency response for fire fighting in industries. 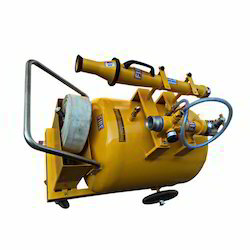 Water foam monitor is mounted on trailer with foam concentrate storage tank. Trailer is having two wheel pneumatic tyres. 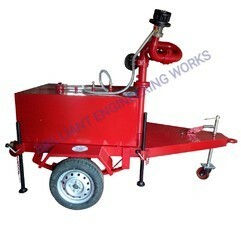 The unit can be easily maneuvered by two persons or pulled behind by light truck or jeep. The trailer has four stabilizer legs. The foam concentrate storage tank is of Stainless Steel. The tank capacity can be 500 liters. A water supply manifold connected to monitor is provided with 2.5” instantaneous male inlets. 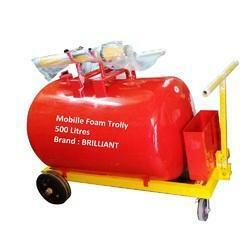 Looking for Mobile Foam Trolley Unit ?